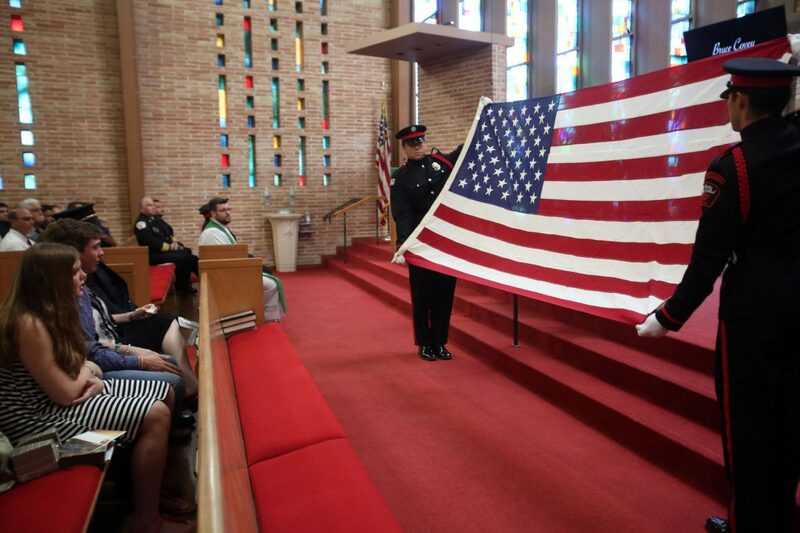 McAllen Fire department Honor guard fold the U.S. flag during Bruce Covey;s memorial service at St. Paul Lutheran Church on Monday, June 11, 2018 in McAllen. Bagpipes and fire engine sirens emanated from St. Paul Lutheran Church Monday morning as three calls made to the fire department’s chaplain went unanswered, ceremoniously signifying that William Bruce Covey, a beloved figure in the agency and community, had answered his last call. Such was the emotional scene inside the McAllen church, where sunlight filtered through the stained glass, and Fire Chief Rafael Balderas handed an American flag to Covey’s wife, Oleen Teer Covey. Covey, 75, was a former volunteer firefighter, the chaplain for the McAllen Fire Department, a member and former president of the McAllen Noon Lions Club and an insurance salesman. He died June 3 of a heart at-tack. Covey joined the department in 1978 and briefly fought fires before injuring his leg. He continued volunteering, and when he became the Rio Grande Valley’s district chaplain, he often led memorials for fallen first responders. When he died, fire departments from Rio Grande City to South Padre Island called to offer condolences. “I retired in 2011, but Bruce wasn’t going to retire until this day came,” Drewry said. According to family, Covey’s giving spirit was evident in everything he did, including his 50 years selling insurance. Tina Salinas, his friend and fellow insurance salesperson, said his mentorship helped her feel less alone when she was new to the industry. Even in his later years, Covey’s compassion never wavered, apparent in his McAllen Noon Lions Club membership, serving the local chapter of an international organization dedicated to community service. Eddie Williams, the current president and a friend since the 1970s, said Covey lived a life devoted to others.